Heart-shaped maps are one thing, but maps of the human heart are quite another, and I’ve got both on this Valentine’s Day. The charting of emotional territory, as opposed to physical space, has resulted in the production of several interesting maps from the seventeenth century to the near-present. 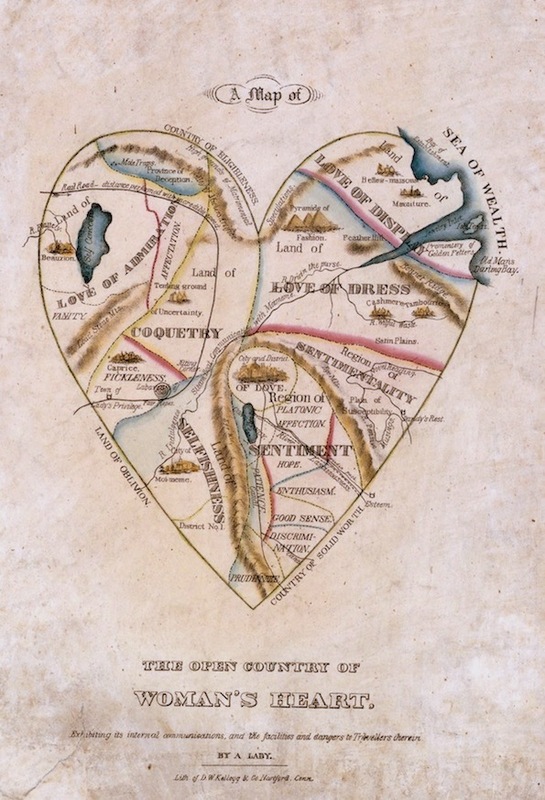 Below are the companion Map of the Open Country of a Woman’s Heart and Map of the Fortified Country of a Man’s Heart, ostensibly and anonymously drawn “by a lady” and published by the Kellogg Brothers of Hartford, Connecticut in the 1830s. 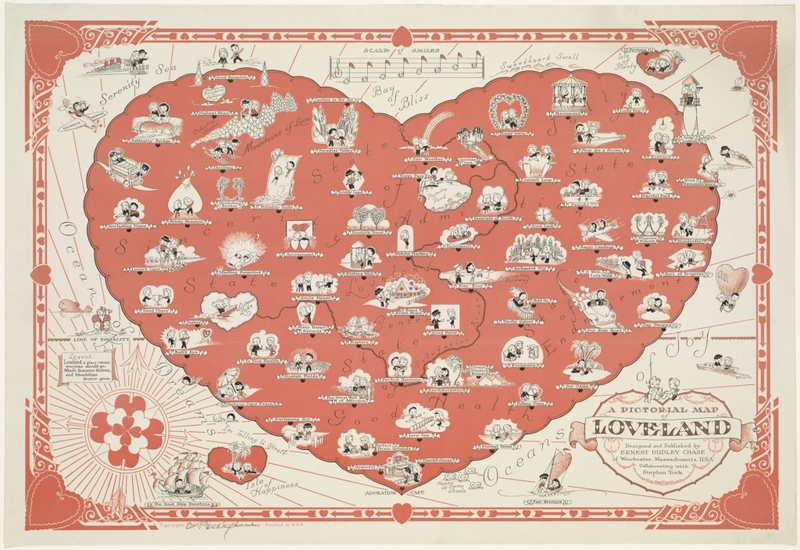 These heart maps, along with lots of other examples of the Kellogg’s impressive lithography, can be viewed at the online gallery of the Connecticut Historical Society and Museum. I’ve brightened and cropped both maps so that you can better see the different regions that make up these human hearts. It’s very interesting that the woman’s heart is an “open” country while the man’s is a walled fort. Money seems to take up a lot of territory in the man’s heart while outward appearances dominate the woman’s; romance and sentiment take up space but love is referenced only with power, ease, eating, dress and admiration! Matrimony is very clearly outside of the man’s heart (whereas the “citadel of self-love” is inside). 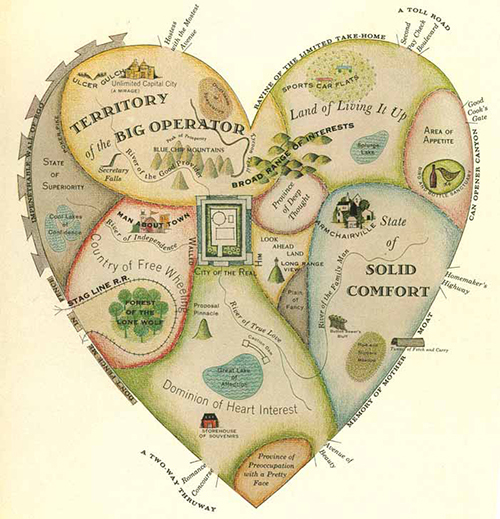 These heart maps seem to be fusing together two cartographical trends from the early modern era: the cordiform map, in which actual places are displayed in a heart-shaped map, and allegorical maps, which use map formats but dispense with the places altogether in order to put forth the message, often in caricature. The most famous world map with a cordiform projection, the Nova, et Universi Orbis Descriptio of Oronce Fine, was published in a succession of early modern atlases after its initial appearance in 1531. 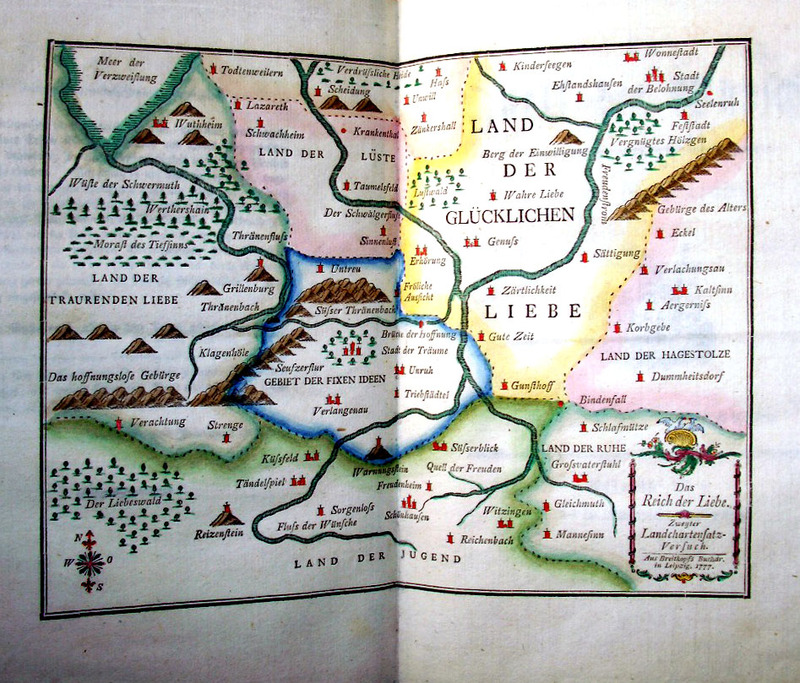 As for the allegorical, two very sentimental maps were published in the sixteenth and seventeenth centuries: the carte de tendre, a road map to and through the country of “tenderness” first published in Madeleine de Scudery’s novel Clelie in 1654, and the “Empire of Love” map published by German typographer Johann Gottlob Immanuel Breitkopf in 1777. 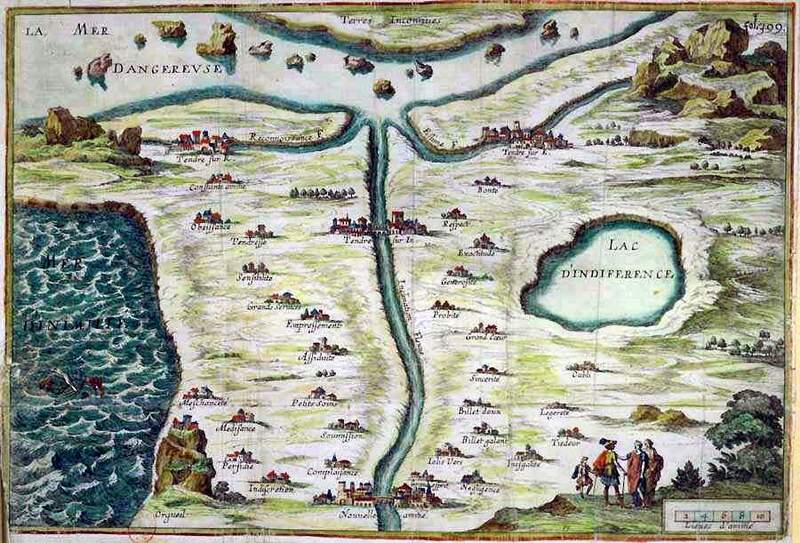 The Carte de Tendre: beware of the “Lake of Indifference” and “Dangerous Sea”! The Empire of Love: proceeding from the “land of youth” at the bottom, northward to the “land of lust”, and then easterly to the “land of happy love” (hopefully). 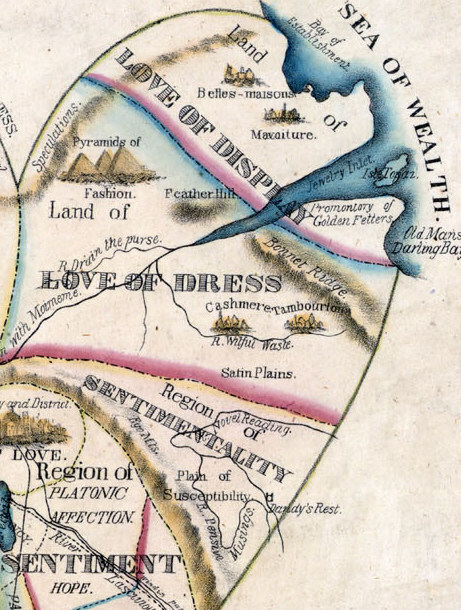 Even after the turn of the twentieth century, emotional maps continued to be published in various formats. 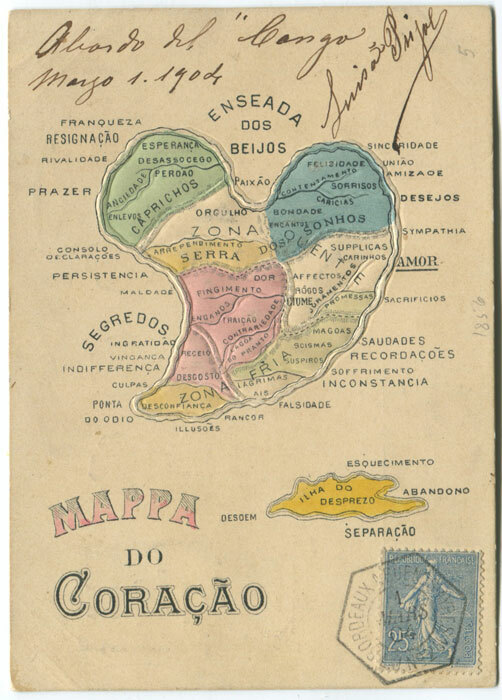 I found a Brazilian postcard from 1904 in a collector’s forum along with a locally-made map of “Loveland” in the collection of the Leventhal Map Center at the Boston Public Library (part of their ongoing exhibition of “unconventional maps”), and two heart maps that are clearly based on the Kellogg prints which were first published in McCall’s Magazine in 1960 and reprinted in the fascinating book by Katherine Harmon, You are Here: Personal Geographies and Other Maps of the Imagination (Princeton Architectural Press, 2004). A map of “Loveland” by Ernest Dudley Chase dating from 1943; it doesn’t scan very well, but a zoom feature is available at the BPL map site. Lots of very 1940s-ish cartoon characters. Times and sentiments change; I think we’re about due for an updated map of the human heart. This entry was posted on Tuesday, February 14th, 2012 at 7:59 am	and tagged with books, ephemera, maps, print culture, Valentine's Day and posted in History. You can follow any responses to this entry through the RSS 2.0 feed. Fantastic! With today’s technology and photoshop, I can’t imagine what a new map might look like. Thanks, John. Besides design, I think the different perceptions regarding gender would be interesting. Happy Valentine’s Day to you and Sally! Stereotypes were abundant to be sure, but what a fun approach. Thank you for sharing something truly different this V-Day! These are really cool. I have never seen heart maps before. What fun art projects! Congratulations on being Freshly Pressed and Happy Valentine’s Day! Happy Valentine’s Day. I enjoyed reading about the maps. Awesome grouping of pictures. I am going to try to print them. I think they would make a great themed display. What a great contrast to the usual sugar-soaked approach to Valentine’s. The maps themselves are beautiful works of art and mind. Many thanks! I wonder how a modern map will look like… space of iPods/iPads perhaps? Best valentine’s post! So cool! 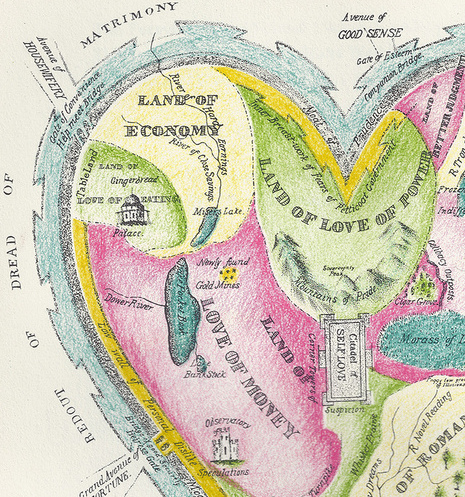 Really beautiful allegorical maps of the heart – perfect for an intellectually stimulating Valentines Day! Hoping each of our friends have a wonderful day, whether you spend it with a loved one or enjoy a quiet night of chocolates and movies with a friend! Much more superficially though!! Try my other posts. you might find something there you like. Super funny….and food for thought! This is so “COOL!” to me! Check these “Maps!” and history out would ya? these are great! would love to find one to frame for my home. thanks for sharing! The changes in human perceptions over the centuries is most informative and interesting. Thank you so much for sharing this work which was a true labor of love. I found this incredible interesting and intriguing. Isn’t the human heart really something?! Absolutely wonderful post! The 1940s one reminds me of the “Love Is” comic strips. So cute! Obligatory Valentine’s Day post. Except this is cool and not mushy/boring. Also, it is a reblog. This is excellent. Thanks for posting! I love maps and hearts. This is so delicious. This makes me want to create one for myself! Reblogged this on if you can't say it, write it!. Fascinating. Thanks for posting these maps…good stuff! Thank you for sharing your wonderful finds! It was great to learn that the Kellogg hearts can be found close to my own New England map of home. I was particularly taken with the outlying, less defined areas of the 1830’s hearts. And, I found that I related less well to Jo Lowry’s 1960’s hearts. These days I think I’ve taken up residence in the “country of solid worth” having survived the Carte de Tendre’s “lake of indifference”.
. . . such fun to comtemplate! Great post! I want to print these out and hang them all over my house. I love them. Interesting post. Love the maps. i do wonder if much has really changed since those first maps, regarding the heart? just because culture changes, does it mean our basic wants and needs regarding love and affection does as well? lots to think on. I liked the “beware of the land of indifference.” how true! great post and images. These pics are so cute! I would love to see a map of the head/brain next time with all the emotions on it. Fascinating and Inspiring! Congrats on being Freshly Pressed. I wrote an article titled; The Man I love; Happy Valentine’s Day!!. Very intersting article. Visit my blog the goldenfingers. I would love to hear your comment(s). It is a few days early for me to be posting a “geek-out Sunday” article but this great post from Donna Seger is too good to not share. 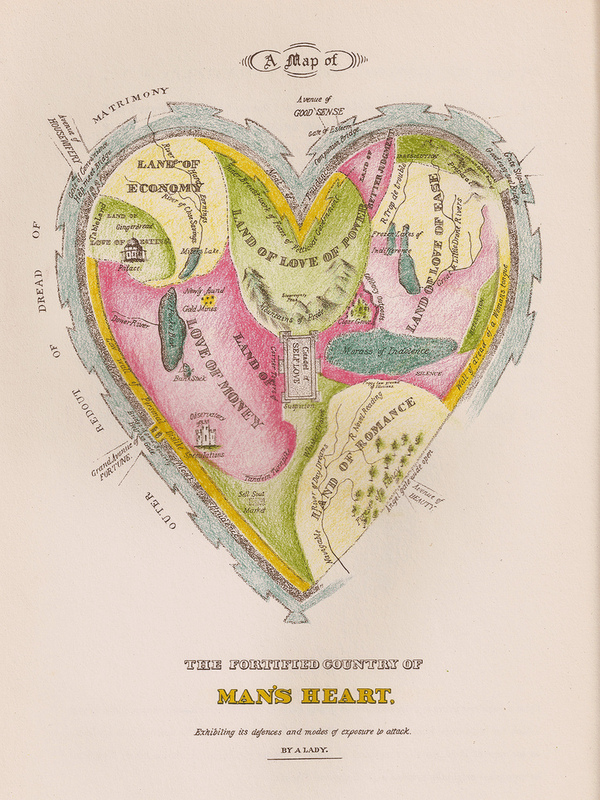 These maps of the human heart are beautiful and humorous examples of 19th century geekery. I thnk an up to date map will have a larger love of self area and more obstacles to get into the love areas. The materialistic areas will be larger for sure. A very fun and intersting post! I wonder how they compare to the ancient maps of our organs and emotions? yeah, very funny! I talked about the maps with some other artists at my work space today. There were some interesting ideas of new contemporary areas. It takes a while for visualisation. So much ideas and fields of emotion… I will give you an update soon. I use the heart-shaped as the entry page for my travel blog. Fun to see it again here, along with your other interesting examples. Wonderful discovery of the past. Love those iconographic maps! The remarks of human negotiation in context of love that is always dynamic. Incredible. Such a perfect species we are. The excellent question is, how is the map of human heart nowadays? I have truly never seen any images like these. Wow! This is a treat, and congrats on being Freshly Pressed! Looking forward to more. Cheers! Very interesting. I really enjoyed this. Nicely done. These are really neat, thank you for sharing. This is such an informative post. Loved the map of the woman’s heart and man’s heart! Thanks you so much for sharing! Oh and congratulations for making it to ‘Freshly Pressed’! What a lovely post. I love all the illustrations. Very cool. I heart this. Was that too obvious? This is really lovely. Thanks. great post really very interesting to see this………..
Hmmm. These maps should be included in the “Human Physiology” text books. After all we read the presence of SA nodes and AV nodes residing inside the myocardium, what’s the harm in adding these maps then 🙂 Excellent work. Thanks for sharing. This is very good, but it should later be turned into various posts, partly because of most bloggers’ attention span, but mainly because everybody’s memory is so full of crap that nothing good or bad gets in anymore. Maybe instead of “heart”, now it ought to be “memory” . It’s so different! I love it! Thank you for your post of the beautiful maps. I loved it so much that I shared it on my facebook, and a friend already re-shared it on her wall. It made my Valentine’s Day what it is: shareing of hearts! What a wonderful post, I hope you had a happy Valentine’s Day! 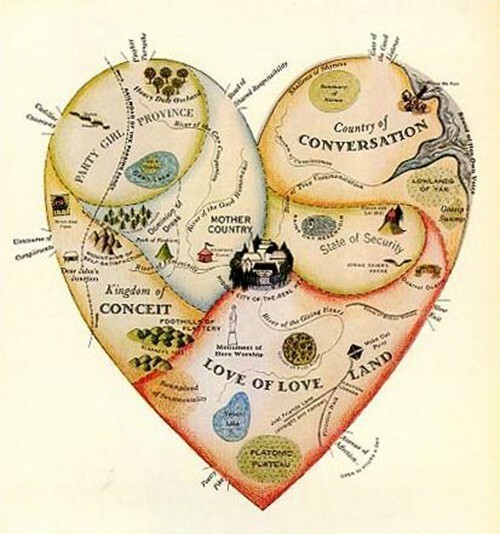 I love maps (remnant of an architectural education) and I think I’d been aware of heart maps in a vague way but these are brilliant all collected in one place – I want to go and find the books you mention too. Thank you for sharing something beautiful and educational and congrats on making Freshly Pressed! I’m looking forward to browsing through your other posts. I’d never seen these before, really interesting! Amazing how they determined what parts of love goes where. Of course, love is different for each of us, but the fact that they mapped it out is intriguing in and of itself. This is really good, iam enjoying……..
I’ve heard about Phrenology and the points on the skull, but the heart: these are wonderful. I love old maps of any kind, so this just adds a great dimension. They’d look amazing framed and given pride of place on any wall. Love your heart maps! I heart all maps! timely post for Valentines. By the way any newly “Maps of the Human Heart” made on our time? Very interesting, and timely. As a landscape architect, I am interested in how physical space and emotion interact. Like all expressive therapies, I feel that physical space can help us locate what is in our hearts and minds.So it isn’t surprising to see these emotional states mapped out, as in these early examples, as if they were physical spaces themselves. Thanks! Really a wonderful project and and a great idea!!!! Gorgeous!!! A beautiful and interesting post. Very unique. Well that’s pretty interesting. I’ve never seen anything like this before. Thanks for sharing! That was a great post, one of my favorite posts of February by far!! What can be more endearing, moving, even passionate that finding your way through the human heart map… Outstanding! Loved this! I love old maps, didn’t even realize anything like this even existed. Thanks so much for sharing! The map of my heart would include the Mountains of Conan O’Brien, a sea of maple syrup, and plenty of laughter forests. What a horrible place. Thank you for this wonderful post!! I reblogged on “Random Hearts.” I think everybody will really enjoy it. These are beautiful, thanks for sharing!! Re-logging this fresh-pressed page, if not for the sheer brilliance of making a heart-map surely because I feel I fit so snuggly to the notion f a heart-traveler . . It’s all there: the unceasing willingness to dive deep, explore or roam, the dealings with all the precarious situations of traveling (think of losing your belongings, having to go thru customs and shady travel agents, finding one’s way throughout the labyrinths of landscape, inner or outer . . Deciding, where do you wanna go and which way would take you there, does the place feel comfy or warm enough or does it leave you high and dry despite all the efforts? And, how do you feel about back-packing, or would you rather skim those lands lavishly, into a set of luxury items given in return to one’s love of not venturing beyond their comfort zone? How far can you go? Well, to be honest, I wanted to rest but it seems it is not happening so there, back with the map thing in hand – it just is what it is and beyond . .
Wow, awesome post! I have seen most of these maps when poring over Katherine Harmon’s “You Are Here” book in a bookstore. Very fascinating. Fascinating! A really beautiful and interesting post, thanks for sharing! Thanks for opening my eyes to the amazing posibilities of maps that I’ve never dreamt of before. Reading this I was reminded of Jonh Bunyan’s Pligrim’s Progress and the way he uses a real geographical journey and the land traveled to represent a spiritual journey. I’m just struck by the incredible creativity of the people who made these maps. It’s inspired me to try out a few of my own. I hadn’t thought of Bunyan, but it’s a great comparison, thanks. Very cool. All this time we’ve been mapping the human mind and we’ve been mapping the wrong organ. Thanks. Keep Blogging. Keep Writing. I had no idea there were maps of the heart. Very interesting and great pictures! A very interesting and thought-provoking post!! Kudos on freshly pressed!! I think all the facts are correct, be it a man’s heart or a woman’s heart! This gives a new light to know how my heart functions and find striking link to my core values placed inside the Map…i think the sexes should possess these maps for better understanding…Thanks for this article! Absolutely brilliant! I love this! Wonderful “maps” you found. You might like to check out my blog…I’m steeped in history too, living as I do in Milan. I will, and lucky you: the site of my very favorite cathedral! This is the best Valentines blog post I have seen to date. What a refreshing take on the Heart. Who knew? Thanks to you, I do…now! Incredible post! Oooh awesome! Very interesting, and a refreshingly different take on the traditional Valentine’s Day post. Your cupid arrows struck many hearts with this post. Brilliant. It’s all about maps! People love maps! Map is the easiest way to get into a woman’s brain. May be a brain map soon? Wow! What a great post…I love reading about this kind of stuff! Congrats on being Freshly Pressed. What sweet little maps. I love bit of romance as I haven’t got a romantic bone in my body. No one reading this post is getting accused of being heartless, that’s for sure. Excellent post. Thanks, Taylor: I’m glad they inspired you. They’re just wonderful. I collect hearts and hands and am always looking for something new and exciting. The maps so inspiring. this is so interesting! thank you for sharing this. beautiful and inspiring! This is a fun post about some Must See illustrations. Someone posted the Map of a Woman’s Heart on FB. Thank you to Beth and Micaila for pointing out more of the story. I would Love a poster of the woman’s and man’s hearts side-by-side. I think they are such quirky fun while being an interesting insight.